With astonishing erudition, a commanding sense of style, and a gift for gripping narrative, Senhor Freyre has applied all the modern techniques of social study to the remarkably successful melting-pot culture of “medieval” Brazil. He deals with race, climate, agronomy, sexual habits, architecture, the arts, religion, sorcery, literature, history, food, economics, politics, and the thousand other forces that made the Brazil of today what it is. In doing so, he throws blinding light into the color problem, the meanings of “civilization” and “culture,” the political and economic situation in Latin America, the significance of ethnological and anthropological judgments, etc. From beginning to end The Masters and the Slaves (the Portuguese title literally means Big House and Slave Quarters) is absorbing, colorful, and dense with material. It has the qualities of great literature, not least in that it suggests far more than it states, sends readers’ minds on treks and side-trips of their own. 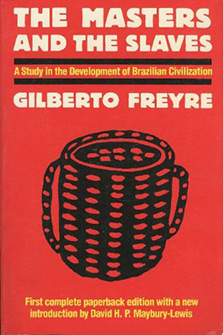 Gilberto de Mello Freyre was a Brazilian sociologist, anthropologist, historian, writer, painter and congressman. His best-known work is a sociological treatise named Casa-Grande & Senzala (variously translated, but roughly The Masters and the Slaves, as on a traditional plantation). Two sequels followed, The Mansions and the Shanties: the Making of Modern Brazil and Order and Progress: Brazil from Monarchy to Republic. The trilogy is generally considered a classic of modern cultural anthropology and social history.